(CNSNews.com) - Leading Democrats are outraged over President Trump's stated intention to ship asylum seekers to sanctuary cities and states. 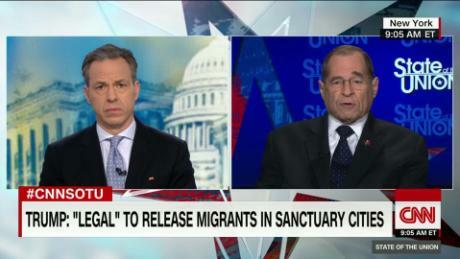 "The president has no right to spend money appropriated by Congress for other purposes to ship immigrants all over the country," House Judiciary Chairman Jerrold Nadler (D-N.Y.) told CNN's "State of the Union" on Sunday. "If someone requests asylum, he should be considered. There should be a place for that person to stay while that request is being adjudicated. This is just -- nor is it right for the president to use immigrants or people who are claiming political asylum as pawns in a fight against political opponents. Just out: The USA has the absolute legal right to have apprehended illegal immigrants transferred to Sanctuary Cities. We hereby demand that they be taken care of at the highest level, especially by the State of California, which is well known for its poor management & high taxes!